The snow has been pretty much nil for much of the Midwest this winter. I'm hoping we start to see the action pick up soon but looking at computer models for the next two weeks it isn't looking too promising. 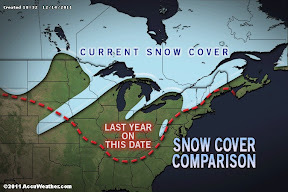 It is interesting to look back to a year ago and compare this year to last year's snow cover. Take a look at the image above. (Click the graphic to see a larger version.). There's a pretty dramatic difference. According to the National Operational Hydrologic Remote Sensing Center, 24.6% of the United States is covered by snow. Contrast that to 2010 and on this date 38.4% of the country was covered by snow. That's a 36% decrease in snow cover! Take that back to 2009 and it's even more dramatic as 48.7% of the country was covered. Temperatures were also a lot colder last year. Minimum temperatures on December 14, 2010 was 1° in Carbondale, 4° in Indianapolis and Paducah, 7° in Cape Girardeau and St. Louis. Instead this year temperatures are in the 50°'s. 4:00pm CT Update: I was curious when the last time we had such a small amount of snow on the ground so I went back and looked at December 14 going back several years. You can see that today is the least amount of snow cover (for this day) in the last 5 years. So I have noticed over the past few years that it gets colder later and that snow comes later each year, and has been coming more in January and February as opposed to December. Does this support the hypothesis that the seasons are shifting? No, it doesn't really support the idea that the seasons are shifting. I am not sure what location you are specifically talking about but looking at snow records for Cape Girardeau doesn't support that idea. I kept track of snowfall amounts in Cape Girardeau from 1999-2011. KFVS12 has records that go back decades. Several years ago I posted the monthly snowfall amounts from the winter of 1969/1970 through the winter of 1996/1997. I also put the amounts I recorded (winter 1999/2000 through winter 2010/2011) on the page. Here is the link: http://www.kfvs12.com/story/159931/stormteam-snow-records. Over the last 30 years, January has averaged the most snowfall (4.1") followed by February (3.9"). December ranks #3 with 2.7". Decembers 2006-2009 didn't see any snow. Neither did December 1999. There was also a stretch for 1981-1990 where we didn't see any snow in December. I, for one, am hoping for a winter with no more snow than what we have already seen. Bring on more 50`s.